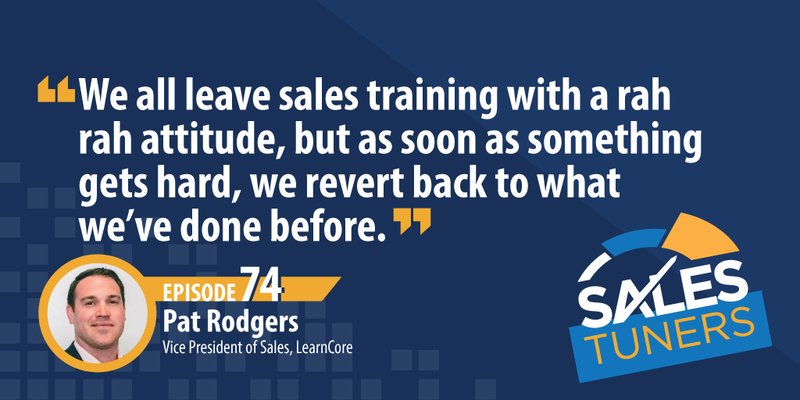 Pat Rodgers, (@P_Rodge) Vice President of Sales at LearnCore, a sales training and coaching platform, uses his training and enablement skills not only in the office but also on the lacrosse field where he coaches kids. Early on the challenge for Pat was gaining confidence and creating his way of delivering the message while remaining within the boundaries of the sales conversation. Instead of sounding like a robot, Pat encourages his sales reps to make stories their own. In his current role, Pat equips his team to understand what the decision maker’s goals are. By positioning the conversation with this in mind, reps can learn the proper business acumen to have high-level discussions. For him, sales coaching is about the little things; it’s about the details that keep high performing reps on top of their game both personally and professionally. Pat empowers his team by having consistent one-on-one meetings but knows If there isn’t any follow through then coaching won’t be taken seriously and the conversation will revert to a pipeline discussion. Frameworks are Better than Scripts: When you try to straight up copy someone else’s style or words, it quickly becomes clear it’s a script and/or inauthentic. You need to develop frameworks of how to handle situations and have the confidence to make it your own. If not, you’re no better than a robot or a recording and I don’t see either of those having much success in sales today. Create Check-down Lists: Most of you listening probably have “required fields” or something similar in your company CRM. While they can be valuable, I’d rather focus energy and training on why I need to get certain things out of each stage. Doing that allows me to go back to #1 and create the framework instead of just a black and white requirement. Don’t Fear the Next Question: If you find yourself afraid to say certain things because you have no idea what a prospect may ask as the follow-up or if you’ll even be able to answer the question, get over it. They’re going to have a next question whether you say the right thing or the wrong thing. I’ve also found that instead of making a declarative statement, if I can reword it into a question itself, the prospect will often reveal the answer to themselves — while thinking you’re a genius for asking it.